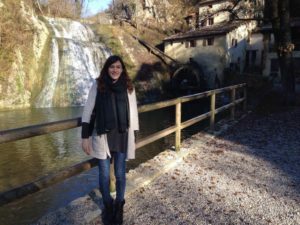 A few weeks ago, I took a quick two hours flight from London Stansted to Treviso Airport to discover the Veneto region, the “Prosecco area” of Italy. Before I even landed I could already see the beautiful sun shining over the snow covered Dolomites, the stunning mountain range of northeast Italy. Enchanting hills as far as the eye can see covered by red and yellow autumn vineyards shimmering under a warm winter sun. I was absolutely dazzled. I stopped at several premium local wineries and I had the great opportunity to meet all these passionate, welcoming, smiley people who told me many stories about their beloved region, their top-quality wines and their family history. 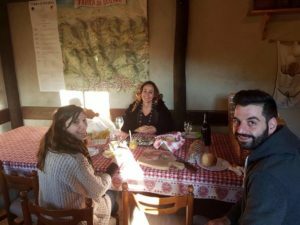 I enjoyed a delicious picnic lunch with local cheeses, salami and Prosecco served in a little cosy cabin in the middle of the vineyards. A sweet grandmother from one of the family owned wineries gave us some fresh bread, made on the day in her old bread oven. I swear bread never tasted so good! I was also taken to a Prosecco vending machine (!!!) 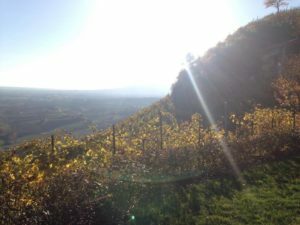 hidden in the vineyards, right by l’Osteria senza Oste (literally the tavern without a host), a unique self-service tavern where people can taste local products while enjoying a breath-taking view and pay what they think it’s worth. Mark’s Square and my curiosity dragged me out of it. I walked through the picturesque little streets and made my way to the famous Caffè Florian, conveniently located on Saint Mark’s Square. Sipping my Spritz, a traditional Italian cocktail made with Prosecco, I had a relaxing evening in the lavish neo-Baroque setting of the first Italian Caffè. When I woke up the next morning, I opened my window and discovered a gorgeous view on Venice canal glittering under the morning sun. 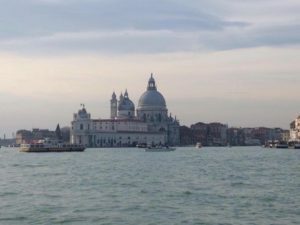 With the few hours I had left, I chose to jump on a waterbus and enjoy the charming city from the Canal, not forgetting to stop by Saint Mark’s Square to glance at the Bridge of Sighs and say goodbye to the Basilica. For more information about our Prosecco tours see our website.